As part of our Grease Eradication Service, we will inspect your grease traps and/or interceptors. 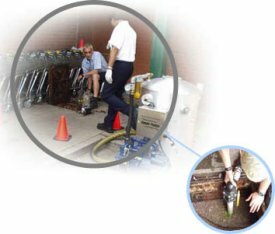 We visually inspect the grease trap, take pH readings and then take samples. If the grease trap needs pumping out, this process will be monitored. Environmental Biotech's Grease Trap Maintenance ensures regular cleaning, pumping out and deodourising whenever required. Over time if you use our Grease Eradication Service, you should experience fewer and fewer problems with grease and potentially reduce pump-out frequency and costs.